Home › FAQ › Where is the trail to Sugar Loaf? 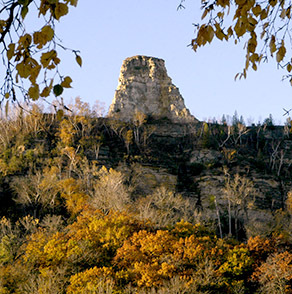 Reaching nearly 85 feet into the sky, Sugar Loaf is a storied symbol of Winona and known by all as its most distinguishing landmark. Hiking trails along its newly-updated front side of Sugar Loaf bluff offer adventure seekers a unique vantage point to see the city. Users, which consist of any silent sport (non-motorized), can utilize the trail that begins behind Edina Realty. Parking is available on Lake Boulevard; not in Edina Realty or Treasures Under Sugar Loaf. To climb to the top of Sugar Loaf , it is advised to use climbing equipment.